Disinfectant tests are used to validate sanitizing agents for effectiveness against organisms, which is an increasing area of concern to manufacturers and regulatory agencies. Disinfectant efficacy must be established before a new disinfectant can be put on the market. Additionally, manufacturers must validate disinfectant regimens for cleanrooms and other controlled areas. Materials tested typically include household and industrial disinfectants, sporicides, fungicides, and hand sanitizers. Disinfectant testing is conducted per many different standards including AOAC Chapter 6 tests, ASTM E2315, USP General Chapter 1072, and ASTM E26140. We are highly experienced in performing general disinfectant efficacy tests to establish kinetic kill curves for a large variety of organisms. The disinfectant validation test is to ensure that the cleaning and disinfectant procedure conducted for a controlled room is sufficient to remove, destroy, or deactivate microbial contamination on objects or surfaces. The USP chapter <1072> provides guidance on a disinfectant regimen in relation to the reduction of viable microorganisms and spores. A validation provides information about the current environment, as environmental isolates are commonly used, and it verifies that the cleaning and disinfectant regimen developed during the validation is effective and appropriate for the surfaces and controlled environment. The risk of a manufacturer not conducting a cleaning and disinfection validation may lead to an FDA 483, warning letter, or the possible release of unsafe product. Nelson Labs has the capability to customize protocols to meet clients’ hard-surface disinfectant validation needs. In the Disinfectant test procedure, representative surfaces that are scaled down for laboratory testing are referred to as “coupons.” The test coupons must be sterilizable prior to testing. The sterile coupons are challenged with 10 – 30 µL of culture or spore suspension. The suspension is spread evenly over a 1-square-inch area and then dried. The challenge culture may include an organic soil such as 5% blood serum to further the difficulty of disinfection, upon request. The actual test procedure involving the application of disinfectant onto the coupon surface can vary greatly and is adjustable to suit testing needs. Examples of disinfectant application include spraying directly or wiping with a sterile towel saturated with the disinfectant. Another variable aspect is the exposure time during which the disinfectant is in contact with the inoculated coupons. Following the disinfection procedure, the treated coupons are aseptically transferred to neutralizing media and extracted to remove any surviving microorganisms. The number of surviving organisms are enumerated and percent and log reduction values are calculated. The panel of organisms selected for this test may also vary. It is recommended that a spectrum of representative organisms be selected for the test, including but not limited to: gram-positive bacteria, gram-negative bacteria, fungi, mold spores, and gram-positive spore-forming bacteria. 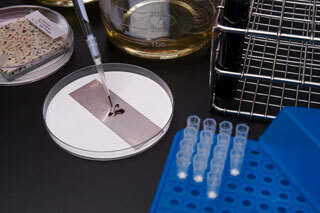 Best industry practice is to perform the test using environmental isolates. Neutralization validation of the test disinfectants and extraction efficiency testing are included in every test for each organism/disinfectant/coupon combination tested, as well as positive and negative controls. If you have additional questions about Disinfection Efficacy Studies, or would like to consult with the experts at Nelson Labs, just send us a request or call us at +1 (801) 290-7500.